The Tablox® Table System is the first modular table system consisting of sturdy solid panels with extrusions designed to easily ‘snap’ and lock into place. Durable thermoformed panels make Tablox extremely damage resistant. Tablox is modular so you can design workstations of almost any size and design to fit your needs. Skyline designed and engineered Tablox to be attractive, easy to use and versatile. With its smart design and superior durability, Tablox modular tables, cabinets and workstations provide great value for trade shows and many other applications. 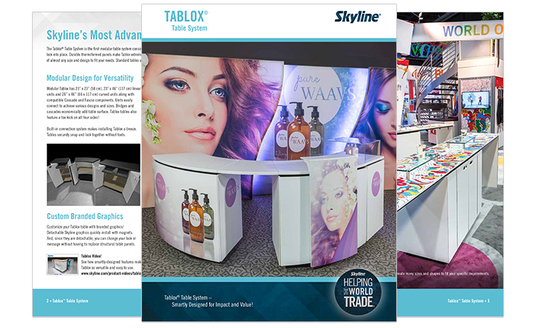 Request a FREE Copy of Our Skyline Tablox Brochure Today! Interested in learning more about the Skyline Tablox® table system? Request a free brochure today.